Use /wild to escape to the wilderness! 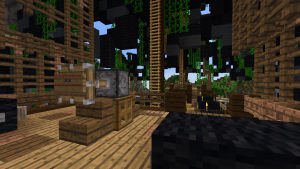 Spawn is where every player, no matter pirate or merchant, emperor or king, rogue or chief, starts their journey into the widespread world of PirateCraft. Where will it take you? You are stranded on a ship in the center of the PirateCraft world, North-East of Cove. Easy access to Cove can be accomplished with the aqueduct. The project 'New spawn' is being lead by Maximus_Terragon, and will kickstart in January-February 2017. For more information, please visit the official forum post, or message Maximus_Terragon via the forums. There is a secret parrot egg hidden in one of chests– can you find it? This page was last edited on 8 December 2018, at 19:30.